OFTEN AFTER LOST OF A VEHICLE WEATHER A CAR OR A BIKE PEOPLE TRY TO FIND OUT IN NEARBY PLACES AND FORGET TO FOLLOW THE FOLLOWING STEPS. 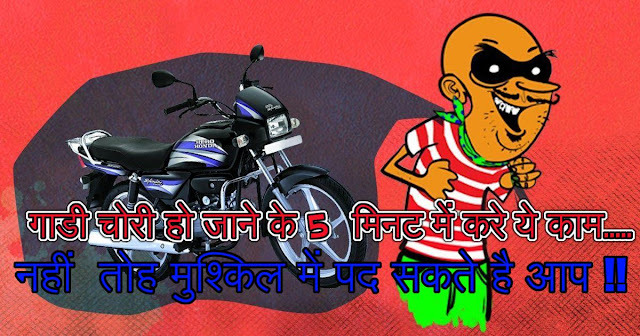 It is mandatory to inform police after lost of the vehicle within 5 minutes because if someone misues vehicle or some accident happen then you will be in trouble and you cannot claim the insurance in this cases. below are some steps to be followed when your vehicle is stolen and need to be foloowed as soon as possible . Make the first call on the 100th number how??? Get information about the vehicle theft, as soon as you get the information first, call the number 100 and inform the police. After giving the information, go to the concerned police station and register an FIR. Find out in the second hand market:how?? After the vehicle is stolen, go to the market where the purchase of secondhand cars is sold. Also inquire with the car repair mechanic. People often do not report in RTO when the vehicle is stolen, but you should also inform RTO about this. Here also police copies of FIR, cart papers and if there is a photo of the car, then deposit it. This will strengthen you legally in the future.